[UPDATE: My book focuses on anglers. But those of us who aren’t anglers can also do our parts by picking up wads of monofilament where we find it. Unfortunately, some have hooks and other tackle attached—I’ve bloodied my own hands on it several times. So make sure your tetanus shots are up to date before picking up fishing line if there is a possibility there may be hooks present. I’ve also tripped on a wad of monofilament that was caught on weeds when I was in Anzalduas Park in Texas, hurting my ankle when I was birding alone. Improperly disposed monofilament represents a clear and present danger to humans as well as birds. My father-in-law was an avid trout fisherman, and I liked to tag along when he went fishing in Port Wing, Wisconsin. I could see and hear myriad songbirds, ducks, shorebirds, hummingbirds, hawks, and other wonderful birds while he focused on fishing, often just downstream of a Great Blue Heron who shared his piscivorous passion. Many of my birding friends are also anglers. It’s easy to observe birds while enjoying this quiet, low-impact sport that is best pursued in exactly the kinds of habitat where birds abound. 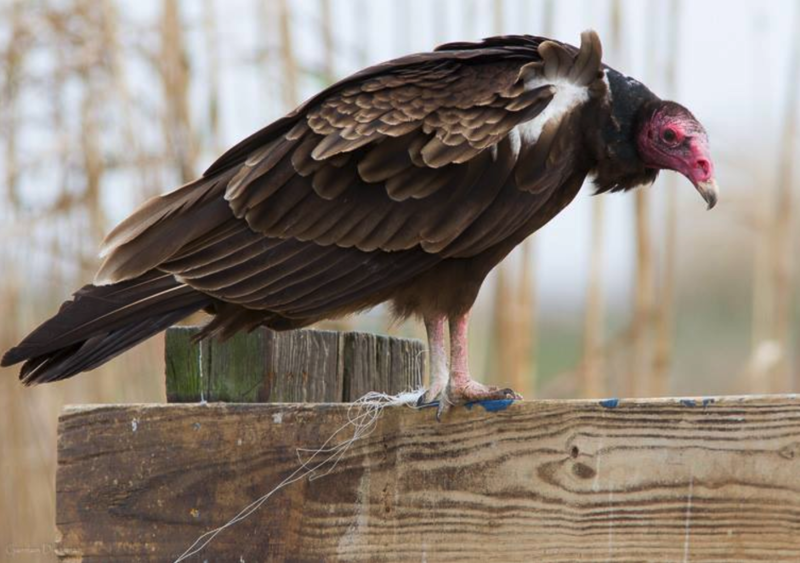 There are two ways that fishing can harm birds. The first involves tackle. Lead tackle, much of which is designed to look like aquatic bugs or small fish, may lure birds. Hooks can kill birds outright, whether they are swallowed or catch on eyes or mouth parts; lures can slice into the throat or esophagus or poison even the largest herons once they reach the stomach and release lead into the bloodstream; lead sinkers can poison bottom-feeding birds that are dabbling for food and grit. Many state departments of natural resources will trade toxic lead sinkers for nontoxic ones. This will avoid many problems, but even nontoxic hooks and lures can pierce birds internally or externally. Remember that when you release a fish by cutting the line, the hook or lure left in the fish is like a time bomb. 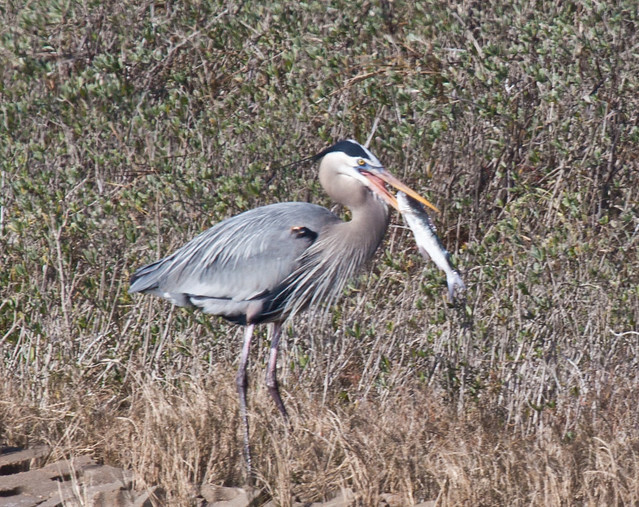 If an eagle or heron catches the fish, it may be injured by the hook, and no matter how the fish eventually dies, the hook or lure will be out there for some unsuspecting bird or other creature to ingest. Be mindful of how dangerous tackle can be, and always do your best to bring home exactly what you brought out. The second danger that fishing poses for birds involves monofilament line. 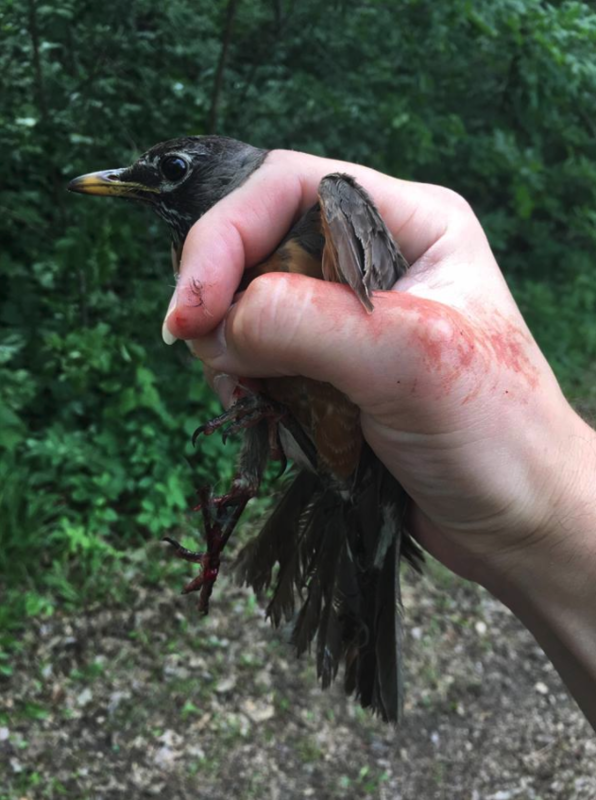 When I was rehabbing birds, I treated several birds that were barely clinging to life after becoming entangled in fishing lines. 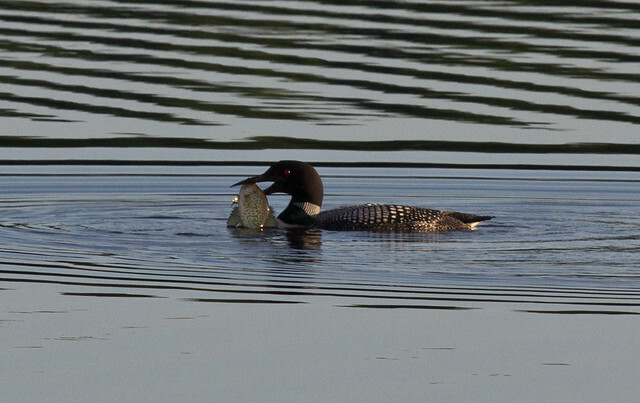 In the case of one loon with line wrapped around its head, neck, and beak, by the time it could be captured, its mouth was a mass of necrotic tissue. 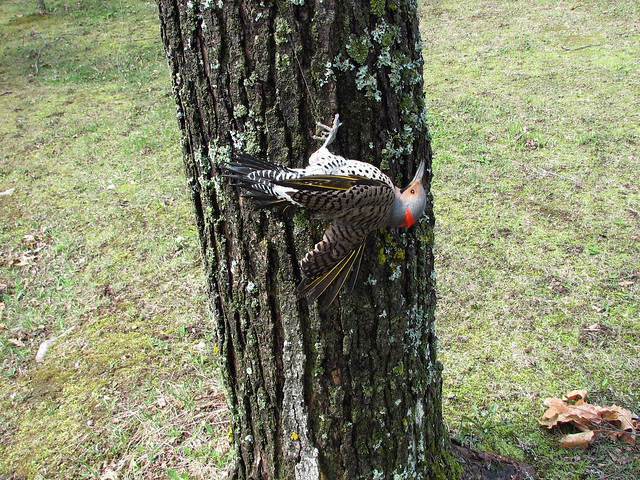 The poor bird had suffered for weeks and ended up dying horribly. I’ve also seen swallows and other songbirds hanging dead from monofilament line caught on utility lines and tree branches near popular fishing spots. Most monofilament is non-biodegradable—it lasts about 600 years. Because it is thin and often clear, it is very difficult for birds and animals to see and they can easily brush up against it and become entangled in it. Once entangled, they may become injured, may drown, may become strangled, or may starve to death. Many animals also ingest fishing line. One recovered sea turtle was found to have consumed 590 feet of heavy-duty fishing line. 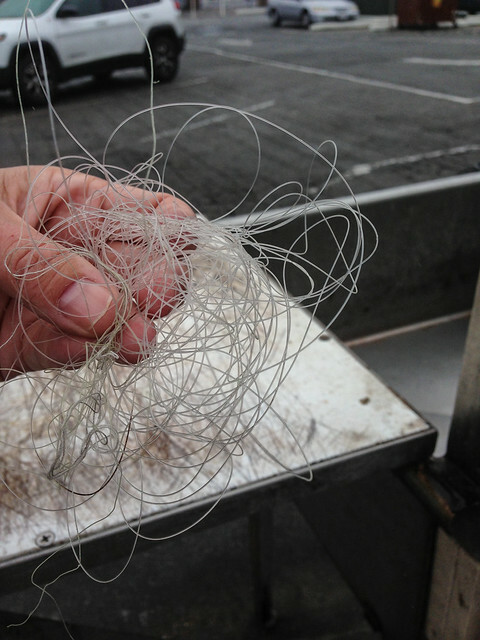 Monofilament is considered the primary cause of all bird entanglements. Florida Fish and Wildlife Conservation Commission biologists have identified monofilament fishing line as the number-one killer of adult Brown Pelicans. The Tampa Bay Watch estimates that hundreds, perhaps thousands, of birds die in Florida every year as a result of monofilament. 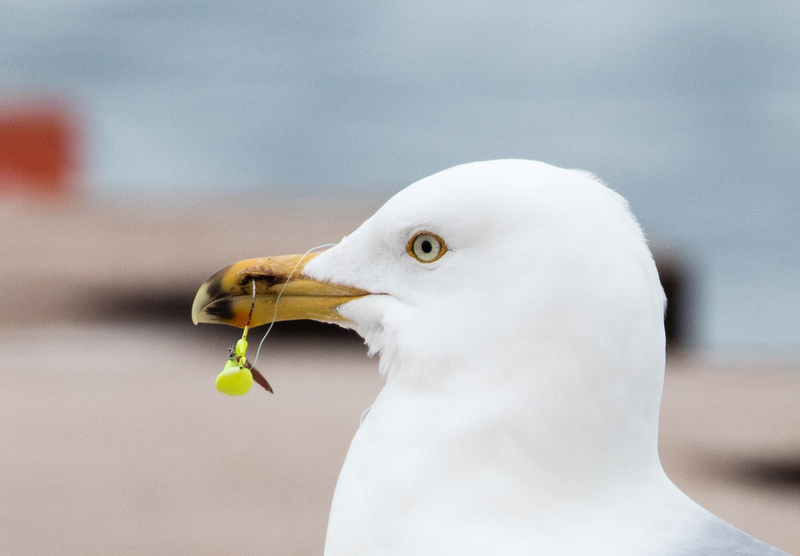 To prevent your fishing line from hurting birds, make sure that you’re aware of branches and wires when casting and take precautions to avoid getting your line caught. If it does get tangled, do your level best to remove it rather than just cutting it off. When disposing of old monofilament line, bring it to a monofilament recycling center. 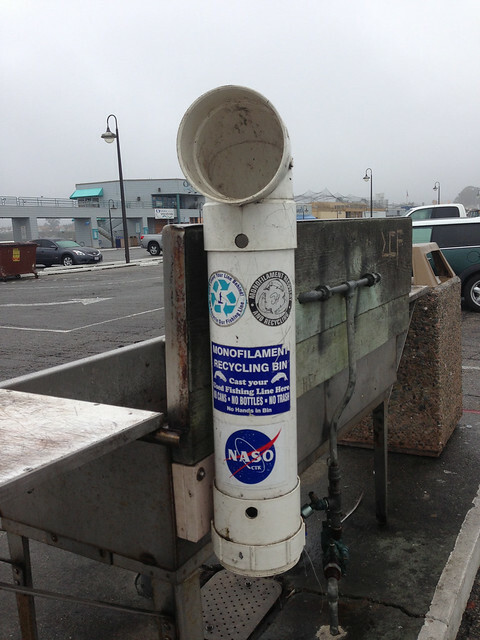 Some states provide recycling boxes near fishing spots; building these makes a good Eagle Scout project. 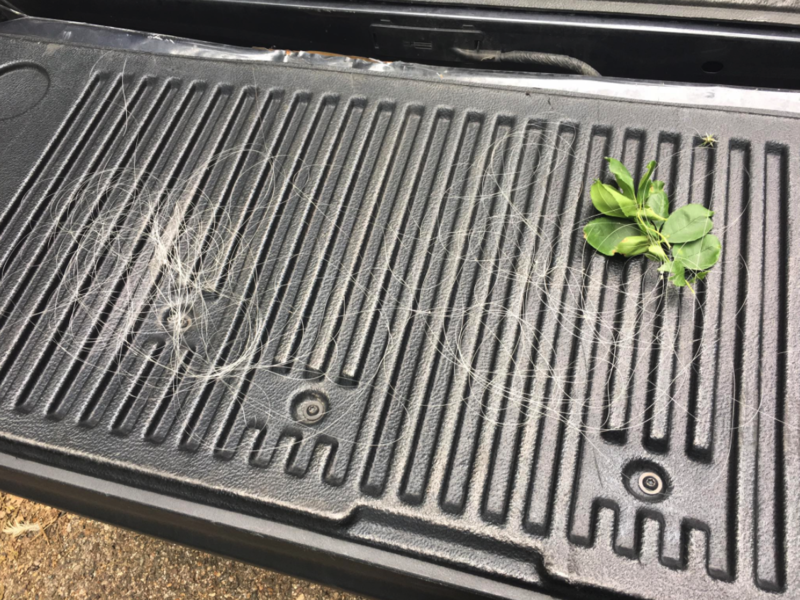 If you can’t recycle it (monofilament can’t be recycled with normal plastics), cut it into very short lengths (less than six inches) before throwing it out. As more lakes, rivers, and streams become degraded from development, acid rain, mercury, nutrient runoff, pesticide contamination, invasive exotic species, and other problems, fish populations are becoming depleted. This is distressing to commercial and sports fishermen, but by working with conservationists to improve the health of fresh- and saltwater resources, anglers can help ensure the future of their sport and benefit the water systems that we all depend on for recreation, a healthy environment, and our very survival. Monofilament and braided fishing lines are bird traps. At the end of each fishing program I lead, I talk about fishing area clean up, emphasizing that we need to leave places better than we found it. While a lot of anglers clean up after themselves, they may not clean up after others. We have to do both as there will always be those that won’t clean up even after themselves. To prevent problems, anglers can use light wire hooks (especially when fishing with bait) and lines that are strong enough to bend the hooks free of obstructions without breaking. Usually lines break at the hook knot when the hook is snagged, but not always. When it breaks elsewhere there is often a trailer of line running from the lure into the water and, sometimes, even up onto land. Anglers need to keep their gear in good condition and that includes lines. Most large tangles left behind are due to onshore tangles at the reel. These are often caused by using old line that doesn’t glide off the reel properly due to its “memory” and brittleness caused by age and sunlight. Old line also breaks more easily, leading to frustration and lost fish. It’s in an angler’s best interest to replace monofilament every couple of years, and much more often if it is used a lot or exposed to sunlight for significant periods of time. The main rule is: just don’t discard line. Unfortunately, anglers rarely carry ways of disposing line with them. Stuffing even a well-wrapped wad of line in your pocket insures a mess with keys and phones and whatever else one is carrying. Plus it is always popping out to get caught in bushes. Putting it in a tackle box is even worse for causing enormous messes. As a result, a lot of it gets thrown away. Not right, but it is human-nature. Keeping several small zip-lock bags in your tackle box is a proactive solution. I usually carry a bunch of small plastic bags, maybe 6x8” in which I dispose unwanted bait (it’s against the law to discard minnows and worms on land or water in Minnesota) and to use as refuse/litter bags. Zip-locks come in handy for all sorts of things from picking up litter to containing bait, organizing plastic lures, etc.